The CSUN 2019 Assistive Technology Conference is now open, and the Dolphin team will be in attendance later this week. 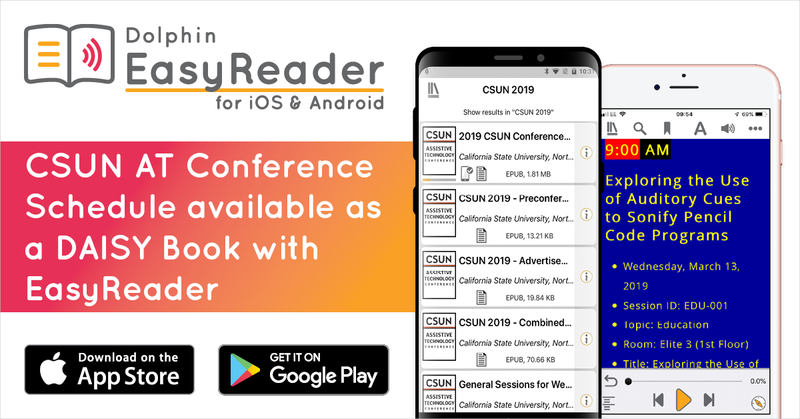 Find us on booth 303 alongside our US distributor Irie-AT Inc.
You can now download the Conference agenda and accompanying information as a DAISY book with free EasyReader, the World's most accessible reading app. What information can you download? Why use EasyReader to download this information? Free EasyReader is available on iOS and Android from The App Store, or Google Play. Once you have clicked on the ‘Books’ icon, you will see ‘My Books’. To read please select ‘Manage libraries’, navigate to the new library CSUN 2019 and select ‘On’. The Conference programme and 14 other Books are available to download and read at your leisure. Choose ‘CSUN 19’ and then add the sections/‘Books’ that you want to have readily available. Choose a section/‘Book’, select the ‘Download’ icon and it will be added to ‘My Books’. Find out more information about Dolphin’s EasyReader. Find out more about DAISY. Find out more about CSUN 2019.